Gamra Bhakar was making mullah on a 3-stone fire when we came to interview her. Mullah is a gravy (usually made with okra, onions, garlic, fresh or dried meat, red chili, fresh dill, and a rock salt called atron) that is eaten with the staple starch, assida (a thick porridge known as ugali in many countries in East Africa), made with flour and water. She cooks for a total of 9 family members, two of whom are under 7 years of age. She makes two meals a day and tea 3-4 times a day. She cooks these meals in 3 pots, one medium-sized, almost flat, round-bottom aluminum pot around 24 cm in diameter, a small, round-bottom, cast aluminum pot 17 cm in diameter, and a small flat-bottomed aluminum pot around 17 ВЅ cm in diameter, using a bundle of “wood” for each meal. She uses plastic and straw as kindling for her fires. She collects wood from outside the camp, even though it is illegal and “not safe”. All the land around the camp has legal owners, and if she is caught on the road, she is at risk of being beaten by “some men”, who will also take her wood. She goes out to collect wood twice a day; an effort that takes her 3 hours each trip for one bundle of wood – a headload. However, once or twice a week, she has to run away without collecting wood because of some sort of danger. Actually, what she collects are branches and roots of a noxious weed that is locally known as oushar. Its stems are hollow, and the leaves contain a milky sap that can cause blindness when touched to the eyes, particularly in children. It takes twice the amount of oushar to cook a meal compared with “proper” wood, therefore Gamra has to collect every day, twice a day. “OK!” “OK!” “OK!” ring out as we pass. Some children are content to wave at you if you are driving by, each anxious to make sure that you have seen and acknowledged their wave. Others will come running perilously close to the car in their excitement. If we are on foot, we collect a trail of children of all sizes (and adults too), all crowding around to see what you are up to; extending their hands to say hello. The bold ones will touch you. Many will comment on Mark’s hair (“he has long hair like a girl”). Some babies cry in fright at the sight of a white man. Suprisingly, almost none of the children in the camps beg. We’ve only run into a couple of boys asking for “chocolate”, which means any type of candy (like in India). Rather, they will offer you whatever they have if they happen to be eating something. “Khawaja okey!” because the khawaja has helped them. There is a separate distribution of two and a half bars of soap per person per month. Non food items (NFIs) that they received when they arrived include shelter materials, plastic sleeping mats, blankets, mosquito nets, plastic buckets with lids, jerry cans (for water), and flat-bottomed, stamped aluminum pots (if the IDPs fled without their pots). 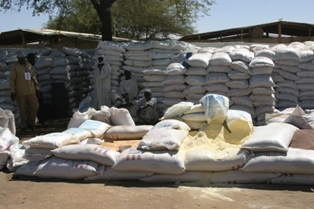 Most IDPs sell a portion of their grain rations (usually wheat, because they are not used to eating it) to buy vegetables, additional sugar, tea, additional soap, firewood, and sometimes meat. So everyday, when we eat, we eat sand. In the bread, in the rice, in the meat, in the vegetables. For that matter, everyday, we sleep on sand in our beds. And, my white and pale blue cotton shirts are now beige. At the CHF guest house, the water comes in two ways. If it comes in the 55-gallon drums, the horses are backed into the compound near the cistern, and the young men who drive the horse and cart empty the drums into two jerry cans and pour them into the cistern. If the water comes in a tanker, the tanker pulls up at the back entrance and empties the water using a plastic hose. Ironically, the water in the camps is better than the water in town because that water comes from wells drilled by the international aid agencies. Half of El Fasher gets their water from young entrepreneurs in the camps who sell water by the jerry can. If your donkey can carry four jerry cans, you can make SD 100 (a little less than US$.50). Unfortunately, the water at the CHF guest house probably comes from a seasonal pool that is used by everyone in town, particularly entrepreneurs who have set up small pumps to wash cars and trucks. I don’t know how much a donkey skin’s worth of water costs, but each set of 55-gallon drums costs from SD 600 to 800, depending on the distance the horses have to travel. And collectively, the five of us in the guest house drink a couple of cases of bottled water a day. The camps near El Fasher have an NGO coordinator that tries to manage the activities of all the NGOs working in each camp. The manager for Abu Shouk and Zam Zam is the Spanish Red Cross; the manager for Al Salaam is International Rescue Committee (IRC). Abu Shouk is divided into East and West, with 28 “blocks” in the East, and 11 in the West. Each block is subdivided by alphabet, with approximately 3-4 households per letter, separated by lanes. Abu Shouk has a thriving main market, which operates daily, and rivals the souk in El Fasher. There is even a “cinema” – a tent covered in blue tarp that shows videos on a small television for SD 30 (about US$ 0.13) for 2 hours. There are “regional” markets within the camp as well as wood and charcoal vendors wherever there is a supply. About 25,000 to 30,000 recently arrived IDPs were moved from Abu Shouk to an adjacent camp a few kilometers away called Al Salaam in June of this year to relieve overcrowding in Abu Shouk and to ensure the supply of basic services. Zam Zam is located 15 km. southwest of El Fasher, a 30 minute drive, mostly on a paved road. The GoS considers this a “rebel” camp and requires security clearance every time you enter and leave the camp. 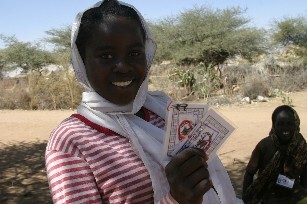 (There is a permanent African Union camp located near the checkpoint.) 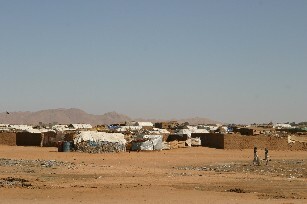 Zam Zam has a population of between 25 and 30,000 IDPs, mostly from Tawila and other areas south of the camp. The IDPs are divided into seven “centers”, two in the South and the rest in the North. 60 to 70 percent of the population is Zaghawa. The market at Zam Zam operates twice a week, on Thursdays and Sundays. We left Khartoum on a 7:30am Mid Airlines flight to El Fasher, the capital of North Darfur, on Monday, November 21. The 5:30am ride to the airport was a quick 15 minutes from our hotel. A CHF driver dropped us off, then went to pick up a new CHF employee, Adam Bernstein, who would be flying with us. (Adam is from Mill Valley; skied on the Freestyle team at Squaw Valley – yet another small world story.) As we approached the entrance, I noticed the sign: Khartoum International Airport. I wondered if we were at the wrong terminal, but Mark thought perhaps that was the sign for the airport, and not the terminal. The guard let us in, and we put our bags through the X-ray machine. At the passenger entrance, the attendant took one look at our tickets and motioned for us to get our bags. He then got a porter to take us to the domestic terminal, which, thankfully, was a short walk away. Pandemonium reigned in the small entryway of the domestic terminal. The ever increasing crowd surrounded the baggage X-ray machine from all sides, poised to lunge at the slightest move of the conveyer belt, which was piled with suitcases, boxes, plastic bags, mattresses, and blankets higher than the capacity of the machine. The belt moved in short spurts, as boxes and mattresses had to be offloaded before the machine could operate. Adam and I tried to make several attempts to get through to the departure gates, but to no avail. We kept getting denied entrance. Meanwhile, motley crews of flight attendants, airline crews, and other people who were clearly not passengers passed through and back. After about a half hour, Mark was able to get our bags on the conveyer belt. Then the three of us waited, making sporadic forays at the gate. Finally, we pushed through with other people who seemed to hold similar looking tickets to collect our check-in bags, covered in red dirt, to be checked in. The Mid Airlines flight was surprisingly empty, unlike the Sudan Airlines flights to the same destination. There were about 9 or 10 people on the Fokker 50 prop plane, serviced by two flight attendants. We flew over vast areas of flat no man’s land before seeing isolated villages, some of which were burned to the ground. Then, as we approached El Fasher, a small IDP camp next to a much larger camp, both dotted with blue and white tarps covering shelters, pit toilets, schools, and community centers. We landed and walked to a covered shelter, where someone came to collect copies of our Darfur entry permit, and waited for our bags, which were piled on the bed of a pick-up truck which slowly made its way to the shelter. The only other activity at the airport was United Nations (UN) helicopters and largely unmarked UN cargo planes taking off and landing. A CHF 4X4 truck, well marked with the CHF logo and flying a large logo flag for identification and protection, came to pick us up. I was surprised to see tens of tiny blue and white taxis at the airport and subsequently, all over town, full of local passengers – little Daewoo TICOs and ATOZs (many of which have their model modified to read: ATO7 or simply O7). On the way to the CHF office and guest compound, we passed many NGO and multilateral organization vehicles and offices: UN Office for the Coordination of Humanitarian Affairs (OCHA), World Food Program (WFP), International Office of Migration (IOM), Relief International (RI), International Rescue Committee (IRC), Kuwaiti Patients Helping Fund (KPHF), German Agro Action (GAA), GOAL (an Irish NGO), International Committee for the Red Cross (ICRC), Oxfam, Islamic Relief (IR), UN Joint Logistics Centre (UNJLC), UN Mission in Sudan (UNMIS), UN Population Fund (UNFPA), UN High Commissioner for Refugees (UNHCR), UN Children’s Fund (UNICEF), Practical Action, Spanish Red Cross, Saudi Red Crescent Society, and so on. The CHF offices and guest houses are in adjoining compounds of two buildings each. It is referred to locally as the “white house” because of the color of the walls, and because of its size. It was the former El Fasher headquarters of Save the Children, UK, which stopped working in Darfur in December 2004 after several staff members were killed in North and South Darfur. The guest compound is composed of two buildings. One houses the living room, with a satellite TV, dining area, kitchen and two guest rooms. Elzein Abbas, the CHF Program Director of North Darfur has one of the rooms, and an intern, Fatima, has the other. The other building consists of a storeroom/laundry room and three guestrooms, one of which is occupied by Paul Longwe, the CHF Program Coordinator, originally from Malawi. Toilets and showers are located between the two buildings. There is a cistern that holds water that is pumped into an overhead tank for the two buildings, and a generator that operates from around 9am to a little after midnight (or until the last person in the office or guesthouse has finished working) that provides power for the offices as well as the guest houses. El Fasher is a small, friendly town – everybody knows everyone else. There are two paved roads in the entire town, one perpendicular to the other. All the other “roads” are dirt and sand. There are two souks (markets) in town, one in the center and the other in the south of town, serving the trucks and truckers. Further south, just outside of town, there is a large livestock market. Most of the buildings are single or two stories, with flat roofs. The one cinema in town is an outdoor ampitheatre, but is not operating because of the 8pm curfew. There is one fairly spacious restaurant called the Roast House, which serves burgers, broasted and grilled chicken, and lamb and chicken shawarma (all pre-made), and one “garden” area where people can sit out and have drinks. Otherwise, the rest of the places that serve food are kiosks that offer various kinds of meat (liver is a favorite) in addition to some beans and lentils at lunch time (a meal that the Sudanese call “breakfast”). There are also a couple of places that serve juices and sweets (mostly of the baklava kind), and an outdoor “cafe” that serves hot milk, coffee, tea, and apple-flavored tobacco in a water pipe. Add two banks, a couple of airline offices, a number of mini-markets, pharmacies, shoe makers, tailors, metal housewares, plastic housewares, metal workers, charcoal and wood merchants in addition to the fruit, vegetable and meat vendors in the market, and you have “downtown” El Fasher. One of the first things we noticed upon our arrival in Khartoum, the capital of Sudan, were the clay jars of water on every block – water put out by businesses or residences for passersby in this dry, hot country. The jars are covered, to keep out the dust and the insects, with a metal cup on top of the lid, or metal bowl inside the jar with which to scoop out water. (Here, unlike in India, people do not have a problem drinking from the same vessel.) And the water is cold from the evaporation through the unglazed jars. What a wonderful custom! Mark and I are in Sudan as members of a four-person team researching the use of firewood and cooking habits of the women in the internally displaced people’s (IDP) camps in Darfur, in western Sudan, in order to introduce more fuel efficient cookstoves than the three-stone fires currently being used by most of the IDPs. Mark gives the background of our project in his posting “Entering the Fray” on memestream. The greetings here are frequent and effusive. Good friends hug and pat each other on the back; people to whom you want to show respect are touched on the chest/shoulder with the right hand before shaking hands. For everyone else, there is a whole lot of handshaking going on. Every person you pass will greet you – and the verbal greetings can go on for quite some time. Water is the first thing guests are served upon entering a house, and guests are treated with abundance. When you visit a Sudanese house, you are served more food than you can possibly eat. The Sudanses would rather throw away food than to appear stingy towards their guests. Even the very poor will give everything they have in order to treat a guest well. Many people will invite you to their house after meeting you once. A typical greeting is: “This is your home” or “this is your office”. We were invited to the wedding of a cousin of the woman who sat next to Mark on our flight from Dubai to Khartoum. We were invited for lunch at the home of our interpreter in El FAsher. And we were invited to share meals with everyone who happened to be eating when we visited or passed by in the camps in North Darfur. People will extend credit to total strangers. You can eat a meal, take a taxi, or buy anything on credit. And Sudanese all over the world will ask any traveler going to Khartoum to carry medicine or cash to their friends and relatives in Sudan. 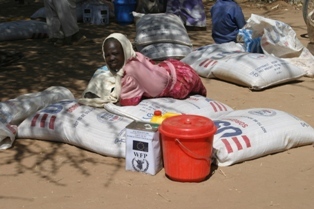 In the camps, people share food, firewood, pots, axes, and almost anything else that someone needs or has.